The Pack Viewer serves two purposes. First, it creates a much simpler way for you to see what packs your character currently has (including Grand Chance Cubes and Dark Vs. Light Event packs), without having to search through your inventory for them. Second, it introduces a new visually enhanced pack opening experience. Let’s look at each section individually. Inside of the pack viewer, it will display all packs which your character currently has within its inventory. It will show the packs icon, name, and how many of each pack you have. Note that this will not display Hypercrates, you will need to take the packs out of the crate first. Along with the pack viewer changes, individual Cartel Packs will now stack in your inventory as well. 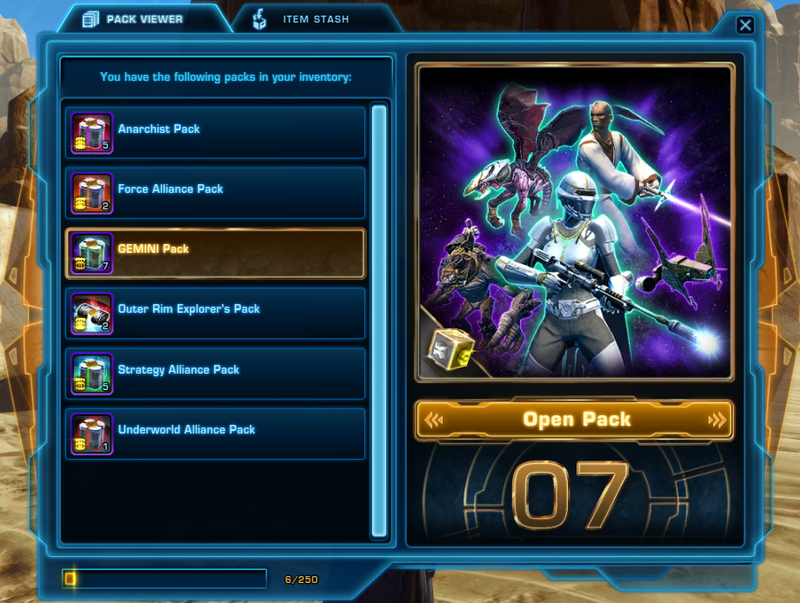 Once you decide that you want to open a pack, click the open pack button in the bottom right of Pack Viewer UI. This will launch you into the new pack opening experience. Inside of this new experience you can individually click each item to reveal it, or simply reveal them all at one time. Once you have revealed all of the items in the pack you can go right into the next pack or exit the pack opening. You may notice that when you opened your pack, the items didn’t go into your inventory. Let’s talk about the Item Stash! Any time that you open a pack, all of the items that you received will be placed in your Item Stash UI. Unlike the Pack Viewer, the Item Stash is Legacy Wide. This will allow you to move items straight from a pack to any character in your Legacy. To claim an item from the Item Stash is very simple. Simply navigate to the item in the list and press claim. This will take the item from your stash and place it into your inventory. Note that the items Cartel Market bind timer will not begin until it has been claimed into your inventory. The Item Stash can hold up to 250 unique items. Unique items stack. Ex: If you have three Defiant Venter Lightsabers, it will only take up one slot in your stash. Items in your stash can be sorted by name, quality, rarity, quantity, or new. Items in your stash can be filtered by type, such as armor, mount, etc. If you have multiple of a unique item in your stash, you can claim one or the entire stack. If you claim the entire stack, the items will remain stacked in your character’s inventory and will all share the same bind timer. We feel that this new pack opening experience along with the Pack Viewer and Item Stash should create a new and improved Cartel Pack experience. Thank you for reading! Star Wars: The Old Republic - Knights of the Eternal Throne! The Showdown With Arcann Begins Today!